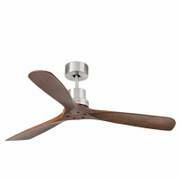 Energy-saving ceiling fan Raja with LED light 122cm / 48"
Westinghouse ceiling fan Monarch white 122cm / 48"
Our modern designs help create a stylish ambience in homes and commercial premises that is both practical and elegant at the same time. Our product range offers current ranges from well-known leading brands, such as Westinghouse, Hunter, Fanimation or CasaFan. Nowadays, motors have bigger dimensions and inside the magnetic field they reach a much higher torque, meaning that the speed that is required for ideal ventilation is reached quicker, but the noise level stays lower than ever before. Thanks to optional remote controls, fans and their features can be controlled from any point of your house, business or commercial space. Fan speed, rotation direction, lighting, dimmer and many other settings offer you a variety of services to regulate temperature, air circulation and indoor climate. The combination of the size of the room as well as the size and features of the fan play an important role for effective room temperature and ventilation. Starting from a size of more than 35 square metres for example, we recommend the use of several fans, because a single fan is not effective on this surface anymore. Like the verb suggests, fans circulate air in a circular surface, so that several fans make more sense when put up in larger places. Our fans shall not disturb you in your daily routines, work or relaxation periods, therefore we focus on modern technology inside the devices. Back in the day, vibrations and bad processing often caused so-called resonance sounds that could not be ignored that easily. These sounds are created when the supporting elements meet ceilings that are made of wood or plaster, and the motor’s vibrations started to make the timber or ceiling “hum“, like the strings of a guitar. ¬¬We recommend mounting ceiling fans to cross beams, poles or supporting elements. Another type of ceiling would be the suspended ceiling, this type can often be found in old buildings with tall rooms, where a second lower ceiling was put up in order to save energy or hide technical installations of commercial spaces. If installing the fan to a suspended ceiling is the only option, the fan should be mounted to the suspended ceiling and the actual ceiling as well, in order to interlock the resonanting surface and prevent noise as there is no possibility for continuing the vibrations. Depending on personal taste, ambience and functionality our wide range of products offers a variety of additional options like lighting, types of control, colours, extensions and special mounting systems. All those possibilities regarding design and customisation have resulted in the trend to equip ceiling fans with other features later on to get a certain look or gain technical features. Fans with included light fixtures have become increasingly popular over the last years, because they combine functionality with appealing design. As many fans are put up in the middle of the room, it is recommendable to chose a model with integrated lighting. When choosing the fan, however, you should pay attention to the wattage to make sure that the room is lit sufficiently. Furthermore a wall switch should already be present to facilitate use of the fan and lighting. 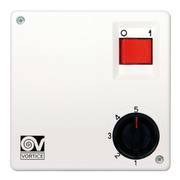 We recommend either operating the fan the conventional way with one pull each for fan and light or using a remote control that lets you select all features individually just as you require in that moment. Radio remote controls even offer a feature for dimming the light. Of course it is also possible to put up a fan without light kit if the room already has enough light sources. This does not affect the installation or functionality of ceiling fans in any way. In order to match the dimensions of the room we advise you to take a look around our website. The bigger the room, the bigger the fans. This recommendation, however, only applies to rooms with a size of up to 35 square metres living or office space, as mention before. The height of the room also plays a major role, because the efficient coverage increases downwards. When purchasing the fitting fan it is important to make note of the rotation speeds the motor can reach. That way too much air circulation can be prevented, as it leads to too much cooling of the body or additional strains of skin and eyes. That is why we recommend choosing an adequately sized fan or putting up several fans in larger rooms in order to have better control and more options. Details about the air flow help with decision about the fitting device, the bigger the room is, the more air has to be circulated. 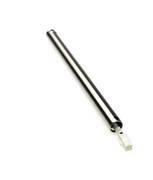 Generally, most of our model provide more than 13,000 m3 air flow per hour. Suspended and low ceilings pose a particular challenge for the installation of ceiling fans. 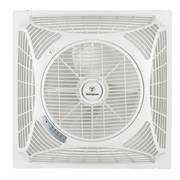 On one hand you do not want to negatively influence the atmosphere in your home, office or your restaurant with a fan that is hanging too low, on the other hand you still need an efficient way of ventilating. Thanks to their construction, which was specifically designed with low ceilings in mind, extra flat fans tap their full potential even though the space between fan and blades is much smaller. The Fanaway model for instance is equipped with retractable blades that automatically fold out through the use of centrifugal force and begin to efficiently circulate air. On top of that the model comes with an integrated ceiling light, that way the fan is converted to a fashionable lamp when it is not in use. Thanks to modern technology our fans can also be put up in challenging places like rooms with high humidity like conservatories or greenhouses, even outdoor areas such as patios, balconies and conservatories can be provided with much welcomed cooling. Damp, humid rooms in particular should always be sufficiently aired out and ventilated, because of the high amounts of humidity the air cannot properly circulate in those spaces. Opening windows and doors are one way to produce relief. Ceiling fans, on the other hand, can support and enhance circulation of air and can even carry out their duty when the residents are not present. However, it is also necessary to be considerate of sensitive flowers and plants, some species need more, others need less humidity for survival. Our ceiling fans that are designed for use in damp rooms have a special casing that prevents penetration by humidity so that an exceptionally long service life is ensured despite the more difficult conditions the devices have to operate in. That way, your plants are provided for and can flourish. Our product range offers many weatherproof models that are suitable for outdoor use and can be put up in the garden, on the balcony or patio. They are made of robust material that complies with common protection classes. The IP codes show what kinds of protection the components have. For example water protection classes 1 to 4 offer protection from rain to splashing and spraying water. The classes 5 to 8 and 9K respectively establish safety despite water jets to use under water. However, our models are not only practical, but also appealing in order to match the garden or patio design in an appropriate, stylish way. Whether it concerns fern pattern or integrated lighting – whatever your heart’s desire, the right fan is waiting. The possibility of an angled ceiling installation is particularly helpful, so that solutions can be found even for the most unique and unusual constructions. For example, the Hunter Outdoor Elements is perfect for any patio or garden, providing cooling in summer and getting rid of annoying mosquitos or smoke from the barbecue. The next garden party is coming, treat your guests and yourself with cool air despite hot temperatures. Apart from their functionality however, the many designs and variations of ceiling fans are worth highlighting as well. After all the fan is usually put up in the centre of the room and catches everyone’s eye as soon as someone enters the home. Though the interior design does not necessarily have to be disrupted, the appropriate models can even blend well with the ambience and be a stylish addition to the rest of the design. Recently, imitations of natural materials have gained great popularity, such as wood, bamboo or natural colours. These designs can have a positive impact not only on the indoor climate, but also on the general mood. To top it off, additional equipment like light fixtures then determine whether the overall look is classic and traditional, or rather modern and contemporary. The Beacon ceiling fan Artemis in dark koa is an example for a sophisticated wood finish and subtle lighting. Together, this combination is a modern and aesthetic addition for both conventional and new-fashioned environments. This model of the 1886 series made by Hunter is built to resemble the “Art Nouveau“ style, with brass colour cast iron and optional add-on light kits. That way the ceiling fan offers different designs and revives a past era. In commercial sectors every detail counts, each element needs to harmonise with the others to create a coherent ambience in the whole house. Lights, decoration, furniture, carpets, but also structural and rustic designs in clubs or bars help define a unique style in all premises. We therefore offer a huge selection of variations, colours and shapes that match your interior design or even serve as a source of inspiration. Elegant white, modern blue, chrome or titanium – our shop gives you the possibility to select your desired colours of the blades and housing, helping you to filter for the model you want. For example, blue has been a popular colour in recent years that is either used as an eyecatcher or combined with intense red, pink or orange and yellow to follow the trend of colour blocking. These styles haven proven their worth in countless hotels and culinary establishments. Those who are fond of a bit extravagancy can use palm or bamboo designs to create a unique atmosphere for the entire house. There are almost no limits to your creativity, for instance colourful and unusual blades in clubs, ice cream parlours or catering businesses find favour with the younger audience. Combining wood and metal in order to enhance the classic atmosphere of the house has been an inherent part of sophisticated establishments for years. Additionally, dimmable lights inside the fans can create a special vibe that goes well with the lamps on the tables or walls. You will find further inspiration in our guide. Fans are not only useful for ventilation during the hot seasons, but also help reduce heating costs in winter. It is a given fact that warm air rises upwards, pushing aside cold air mass. In conventional homes without fans this warm air builds up at ceiling level, and more and more warm air needs to be produced by the heater in order to keep the temperature on the same level. 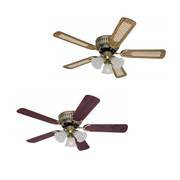 Ceiling fans however mix the air masses and circulate them. Most fans have a forward and reverse function, the latter was specifically developed for dealing with cold temperatures. Sometimes also referred to as “winter mode“, the air is sucked in by the fan from the ground when the reverse setting is selected, so that warm air will be pushed from the ceiling down along the walls. When the fan is in operation, the warm air stays and circulates inside the room, the heater does not have to work as much to reach and keep a temperature that feels comfortable. Due to better insulation and energy-saving concepts in new buildings it is particularly recommended to use fans for a more efficient ventilation in insulated homes. In 2013 on average heating costs for heating with oil amount to about 1.150 Euro, with district heating to 1.507 Euro and gas to 1.300 Euro for a living space of 100 square metres. If you would like to save even more money, you might take interest in on of our energy-saving models. They are equipped with a DC (direct current) motor that saves up to 50 percent more energy compared to conventional models. Most people spend roughly 60 percent of their lives in their own homes, houses and closed rooms. Add that to the amount of time spent in the office or workplace, in the car or public transport. Air quality plays a decisive role for our wellbeing, performance and health, and it is affected by a number of factors. That includes pollution and particulate matter, pets and pests, humidity and state of ventilation. Young children, the elderly as well as sensitive people show particularly strong reactions to low quality of air and, in the worst case, get sick. Air tight insulation of buildings progressively create more compact conditions of the indoor air. For that reason the exchange with fresh air is very important and should be done on a regular basis. The indicator carbon dioxide (CO2) is a crucial factor for public places, because if the exchange with fresh air is not provided sufficiently, the concentration gets too high, which leads to headache, fatigue and irritation. These problems can also be caused by damages that are already present, such as mould whose spores trigger allergies or asthma in sufferers. In combination with the sufficient supply of fresh air ceiling fans help improve the quality of the indoor air considerably. Needless to say, despite the use of a fan, the house should still be aired out regularly so that fresh air can get inside, however the dangers of formation of mould as well as bad and muggy air are greatly reduced when a fan is used at the same time.